CAST LIST / TECH CREW LIST for “ALL SHOOK UP” | Lord...What's My Motivation? Thank you to everyone who came out to audition for “ALL SHOOK UP.” It was NOT an easy casting process. I sometimes wish I could cast you all! Ah! We were really challenged by your offerings and hope you know that however you view the final results, that we’re VERY proud of you all. For those that were not cast, I hope you’ll consider coming back to audition for us again. We’ve got a very exciting season to look forward to next year. 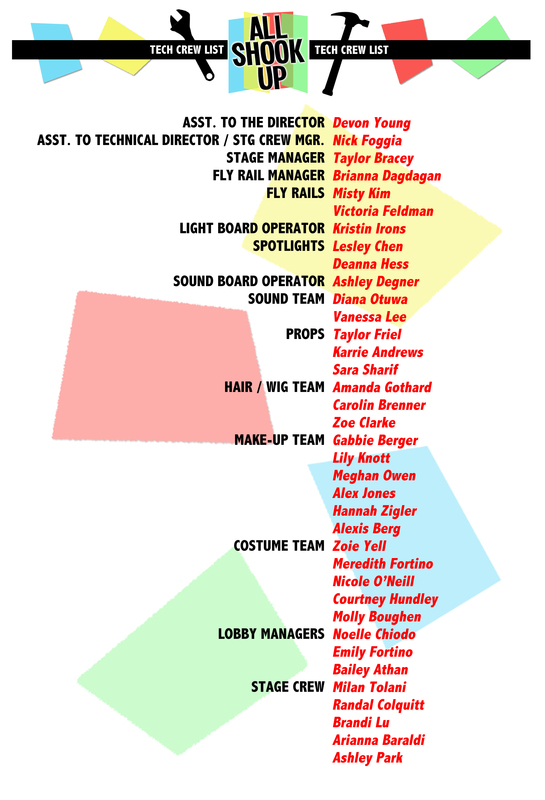 The Tech Crew list was just as hard to generate. Of all Tech Crew forms turned in, we thought you offered some very thoughtful answers. We’re very excited to work with you all! PLEASE EMAIL MR. BALL at ErikBall123@Gmail.com to CONFIRM that you officially “ACCEPT” your role / position. This entry was posted on January 13, 2012 at 11:37 pm and is filed under Uncategorized. You can follow any responses to this entry through the RSS 2.0 feed. You can leave a response, or trackback from your own site. Can’t wait for the show!! Congrats to all.